The Bombardier CRJ200 is powered by two General Electric CF34-3B1 turbofan engines that are flat rated to produce 9,220 pounds (41.01 kN) of take-off thrust. The aircraft cruises at speeds up to 464 knots (860 km/h) and can transport a full load of 50 passengers up to 2,005 nm (3,713 km). 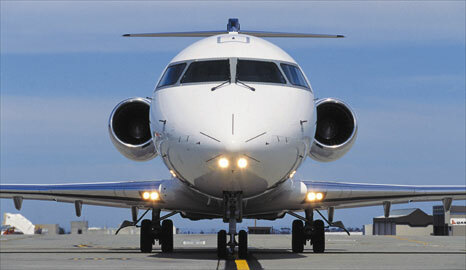 The Bombardier CRJ200 is 87 feet, 10 inches (26.77 m) long and has a maximum take-off weight of 53,000 pounds (24,041 kg). Remarkably, the aircraft requires a radius of only 75 feet (22.86 m) to negotiate a 180-degree turn, a valuable asset at increasingly congested airports. 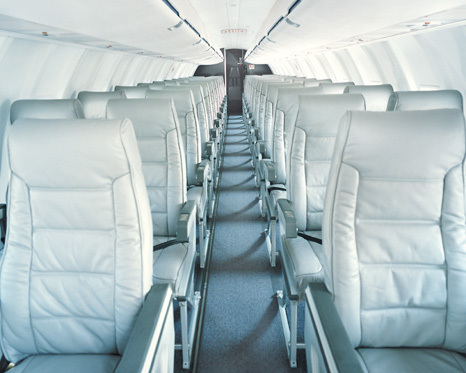 Bombardier Aerospace currently offers three versions of the CRJ200. 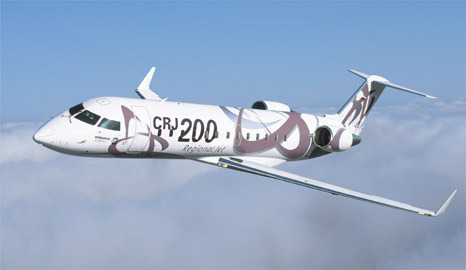 The standard Bombardier CRJ200 has a maximum take-off weight of 47,450 pounds (21,523 kg) and a range of 987 nm (1,825 km). The Extended Range (ER) variant has a maximum take-off weight of 51,000 pounds (23,134 kg) and range of 1,645 nm (3,045 km). The Long Range (LR) model has a maximum take-off weight of 53,000 pounds (24,041 kg) and a range of 2,005 nm (3,713 km).